Broadcast Solutions has begun the delivery of a large order for the state broadcaster for Belarus. Belarus TV has commissioned four production sets to Broadcast Solutions, one of Europe’s largest system integrators. 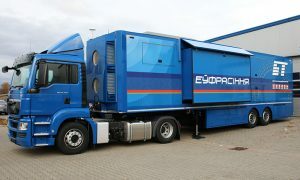 Each set comprises an 18 camera HD OB Van, a four camera HD flightcase studio and a support vehicle. The first two production vehicles left Broadcast Solutions’ production facilities in December 2018 and the bulk order will be completed by April 2019. Until this date, the other identical sets will be delivered to the customer at regular intervals. The reason for Belarus TV’s order (also known as BelTV,) are the second European Games to be held in June 2019 in Minsk, Belarus. To capture this major event comprehensively and to produce to international TV standards, the state broadcaster commissioned the vehicles and flight case studios. One key factor that drove the customer to choose Broadcast Solutions is the company’s ability to respond to customer requests and deliver projects even of this size quickly. All four OB vans have an identical design and work as 20 ton semitrailers with two extensions and with up to 18 cameras in HD: two wireless, two SuperSlomo and 14 standard HD cameras. Each of the flight case studios is designed for four cameras. Within the OB vans, Broadcast Solutions implemented Grass Valley cameras, vision mixers, video routers, multiviewers and slow motion servers. The audio section relies on Calrec audio mixers and audio routers. IHSE KVM systems secure access to computers and workstations, and the intercom signals are processed using Riedel Artist systems. The flightcase studios also work with Grass Valley cameras while FOR.A’s vision mixers and Ross routers are used. Broadcast Solutions’ self-developed control system hi is used in the OB vans and the flight case studios for the first time. hi controls all production-relevant areas in the vehicles such as video routers, multiviewers, audio routers and tally. Intuitive touch controls and newly developed hi hardware controls simplify day-to-day production operations in the OB vans. Part of each production set is a 26 ton support truck, which ensures the necessary independence during productions. Besides the usual storage space, the support truck is equipped with a 62 kW generator and restrooms for the production crew. The restrooms also have a kitchenette including self-sufficient fresh water supply.